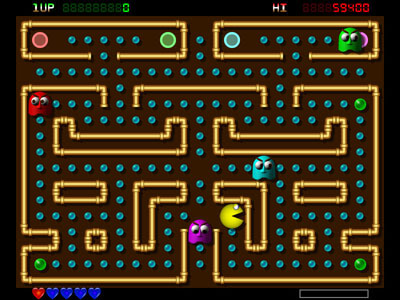 Deluxe Pacman 2 - back to the glorious and classic videogame of the 80's, Pacman, it now has a renovated graphic and there are new obstacles inside the very well-known maze, immensely popular with everyone. 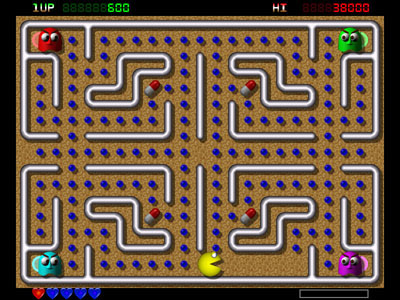 Pacman was, without any doubt, one of the most popular video-games among the young people from all over the world, with its pixelated and simple design as well as the very famous Tetris, these are two-dimensional types of games which add a quite immersive participative component to them. Pacman was used both for consoles and small mobile devices since the success it had was amazing and people spent a lot of time on developing their games. 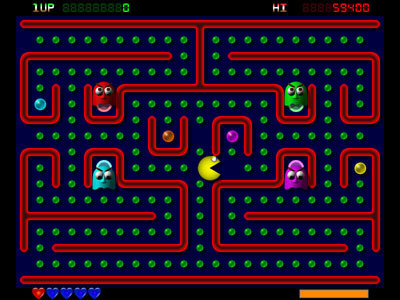 Now, with the Deluxe Pacman 2, Users will have the opportunity to go back and rediscover this game which today now has some exciting new elements incorporated into its distinctive scenes with fluorescent mazes.